Prosecutor Wants Death Penalty For Egypt's Hosni Mubarak : The Two-Way The prosecution said it was illogical that the former dictator did not know protesters were being killed by his forces during the uprising that led to the fall of his regime. 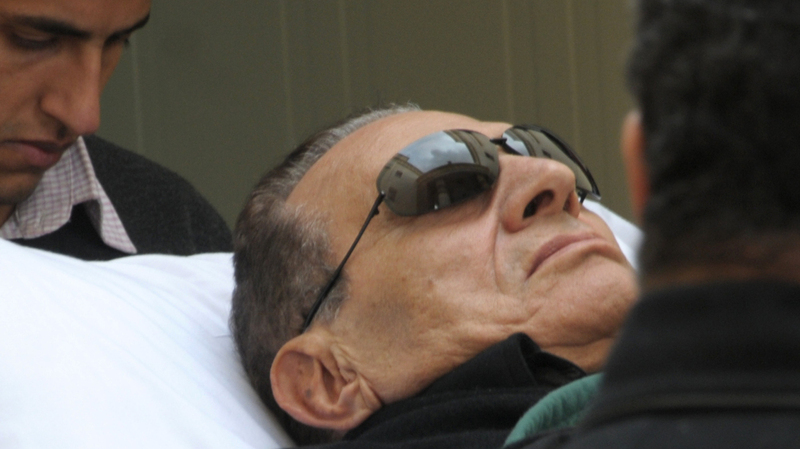 Former Egyptian president Hosni Mubarak arrives by gurney to a court in Cairo, Egypt on Thursday. As the trial of Egypt's former dictator continued in Cairo, today, one of the prosecutors said Hosni Mubarak should face the death penalty for his role in the killing of protesters during the uprising that toppled his regime, last year. "Retribution is the solution," Mustafa Khater said on the final day of the prosecution's opening statements. "Any fair judge must issue a death sentence for these defendants." "Earlier in Thursday's hearing, the chief prosecutor, Mustafa Suleiman, said Mubarak was politically and legally responsible for the killing of protesters. He claimed that Mubarak was made aware of the killings by his aides, regional TV channels and reports by his security agencies and did nothing to stop them. "Mubarak's security chief and co-defendant, the former interior minister Habib el-Adly, authorised the use of live ammunition on orders from Mubarak, he said. "Mubarak, the top official, could never claim that he did not know what was going on, Suleiman told the court. 'He is responsible for what happened and must bear the legal and political responsibility for what happened. It is irrational and illogical to assume that he did not know that protesters were being targeted.'" The Financial Times says that human rights groups have expressed concern about Mubarak trial. Specifically, they are concerned that after a three-month pause, the trial is proceeding too quickly in order to assure a conviction by the time the one-year anniversary of the revolution comes around Jan. 25. Taher Aboul Nasr, a human rights lawyer, told the Times it's also likely that Mubarak could win an appeal. He said the case is incredibly complicated and technical mistakes are likely. But, he added, it's doubtful Mubarak will walk away from the charges. "There are undeniable facts," he told the Financial Times. "People have been killed by bullets and buckshot and a large number of witnesses saw police open fire. The use of violence was systematic because it took place in several provinces in the same way, which means that there orders and not just decisions made by individuals [on the spot.]"